General Hospital (GH) spoilers tease that Jason Morgan (Steve Burton) will use that Dawn of Day cup to his advantage. He swiped the evidence from DoD’s attic in hopes of testing it for drugs. Since Brad Cooper (Parry Shen) is becoming interested in Shiloh Archer’s (Coby Ryan McLaughlin) community, this is the ideal opportunity to insert him in this story. During the week of April 15-19, Shiloh will spot Brad with the cup at GH. After Jason gives it to Elizabeth Webber (Rebecca Herbst) and secures her help, Liz will hand it over to Brad for testing. That’ll give Shiloh the chance to bump into Brad and see what’s up. Will Shiloh be able to manipulate Brad? Will he convince Brad to fake the test results or even just give him the cup back? Shiloh talked to Brad about DoD classes, which appealed to this frazzled father. The stress of keeping the baby swap secret is really taking a toll on Brad, so Shiloh’s peaceful community is awfully enticing. Of course, we also know Brad has no issues with faking tests or lying. If he feels it’s the right move, Brad would certainly be willing to do it again. Brad might fall for Shiloh’s cult talk just like Kristina Corinthos-Davis (Lexi Ainsworth) did. Brad may not be as gullible as Kristina is, but he’s every bit as vulnerable right now. Keeping the truth about “Wiley Cooper-Jones” under wraps has turned him into a real mess. 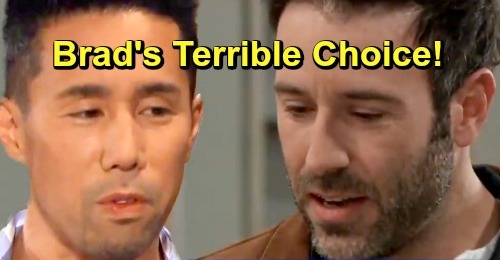 General Hospital spoilers say Brad just might buy whatever tale Shiloh spins and help him out. From then on, Brad might sink further and further into Dawn of Day. Let’s suppose he goes through the painful memory session that Kristina went through. Could a baby switch admission come up? If not, it would certainly be excellent trust offering material later. Shiloh could end up with a crucial way to blackmail Brad at some point. Brad doesn’t want to Lucas Jones (Ryan Carnes) to know the real Wiley died and was replaced with Jonah Corinthos, so he’ll do anything to keep that quiet. Little does Brad know he could be putting “Wiley” in danger. Willow Tait (Katelyn MacMullen) has done everything in her power to keep her child safe, but that’s not really her child. She only believes he is – and soon, Shiloh should as well. Shiloh will inevitably put the clues together and know he’s the father of Willow’s baby, who’s believed to have been adopted by Brad and Lucas. This cult leader will surely go after “Wiley,” which could force Brad to reveal the truth about the baby swap. However, Brad’s drama could all begin with one small cup. If Brad lies about the test result, Shiloh will be free to go after more innocent victims and will probably commit additional rapes before he gets caught. Brad’s interference this time could harm a lot of people and reveal the one secret he doesn’t want to get out. Shiloh is bad news, but Brad may let himself get caught up in his chaos anyway. Will Brad go along with Shiloh and lie only to lose everything he is trying to save? Will Willow go back to Shiloh to protect the child she believes is his? General Hospital spoilers say some exciting scenes are ahead, so stay tuned. We’ll give you updates as other GH details emerge. Stick with the ABC soap and don’t forget to check CDL often for the latest General Hospital spoilers, updates and news.